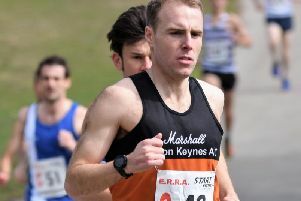 The third Eastern Masters track and field league match at Cambridge saw the MK men win their third consecutive match whilst the women placed equal second with Cambridge. With a home match to follow next month both teams are well placed to reach the League Final. At the Biggleswade Open Meeting the in-form Dickson Kusi set a 100m PB of 10.77 to set a track record and moves into the MMKAC top 10 100m rankings. At the other end of the age scale Dennis Edghill ran the 400m in 62.0 to improve the M60 age group club. More personal bests came from Jack Meijer and Graham Jones competing in a BMC meet at Eltham. Jack ran 3.54.80 to place equal third on the club M20 rankings. Jack is hoping to make the podium at this distance competing in the English Schools Championships at Birmingham this coming weekend. Graham was again agonisingly just outside the two minute “barrier” in the 800 clocking 2.00.59. He has already ran 2.01 twice this summer. It was a very depleted team of ladies that travelled to Liverpool for their second UK Women’s Division Two match and did very well to finish sixth from the eight teams, Wigan being comfortable winners.